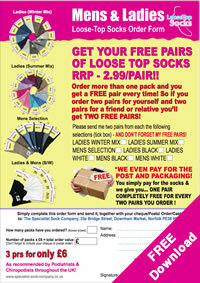 Get your FREE Pairs of Loose Top Socks RRP - £2.99 per pair!! Order more than one pack and you get a FREE pair every time! So if you order two pairs for yourself and two pairs for a friend or relative you’ll get TWO FREE PAIRS! *WE EVEN PAY FOR THE POST AND PACKAGING! You simply pay for the socks & we give you... ONE PAIR COMPLETELY FREE FOR EVERY TWO PAIRS YOU ORDER ! Name: We need your name. Email: We need your email address. Address: UK Mainland Only We need your full UK postal address. Post Code: We need your full UK postcode. Phone Number: We need your phone number. Join Mailing List: (optional) we may share your information with 3rd partys which may interest you. Sorry, we're experiencing problems. Please try later. click to download then print.